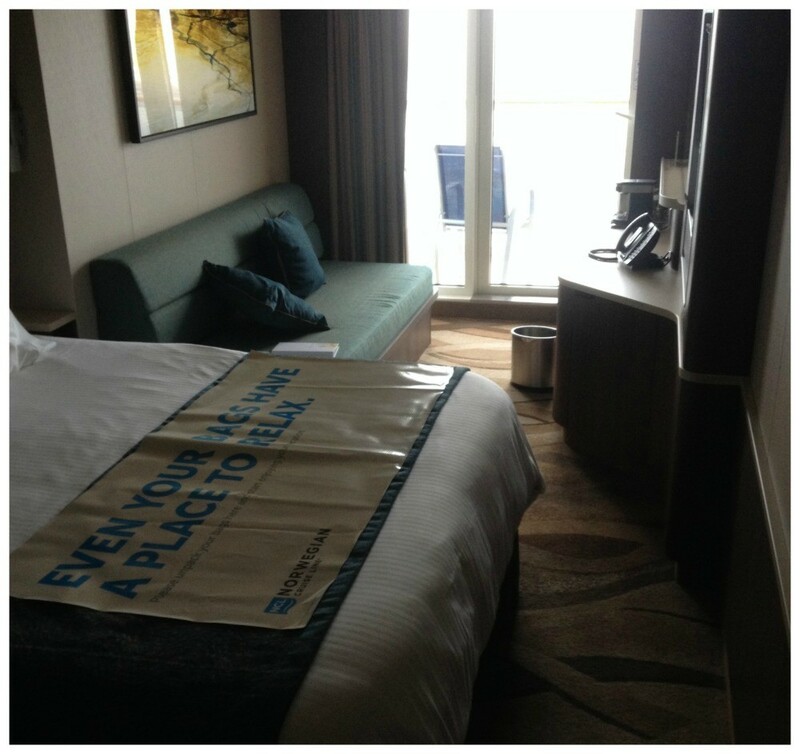 Norwegian Escape Cruise Review – Inaugural Transatlantic Crossing – Southampton to Miami. Having sampled a good few cruises and a mix of lines, this was still our first NCL and our first inaugural sailing with any ship. We’d just spent a great time in the UK and now the day came to ESCAPE to Miami on the world’s newest cruise ship, the Norwegian Escape. (As of the published date). The weather in Southampton was dull, wet and overcast. We arrived early at the terminal having checked out at 11am and were among some of the first passengers into the check-in area. The terminal building was quite nice and well-lit with a reasonable amount of seating. I’m not sure how crowded it got as we were among the first to check-in. As you walked in we were handed a standard health questionnaire to fill out and a number, this was the group number for check-in. We waited for 45 minutes before the check-in process began. After queuing up and collecting our cruise cards in exchange for credit details and passport checks we had to wait again before being allowed to pass through security. This area was a little congested with people not quite sure whether they could continue through security or not. I could foresee this becoming a bottle neck with 4000 plus passengers passing through security. Unfortunately there was not much of an opportunity to get a photo of the ship from the terminal area, this is the best I could get through the window. 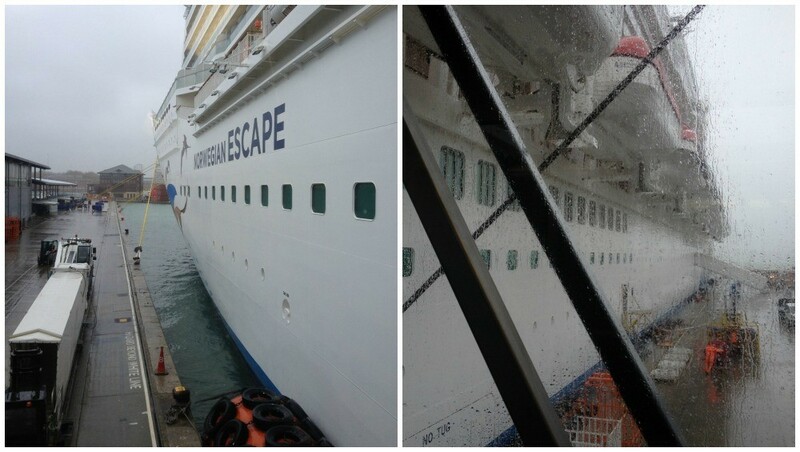 The Escape is a Mainstream class ship from Norwegian Cruise Lines and can hold 4268 passengers and around 1730 crew. Built in 2015 makes her the newest cruise ship today as at November 2015. She is in the larger scale of ships, but not a huge mega ship like the Anthem of the Seas. The information above was taken from the Escape map and plan given at check-in. 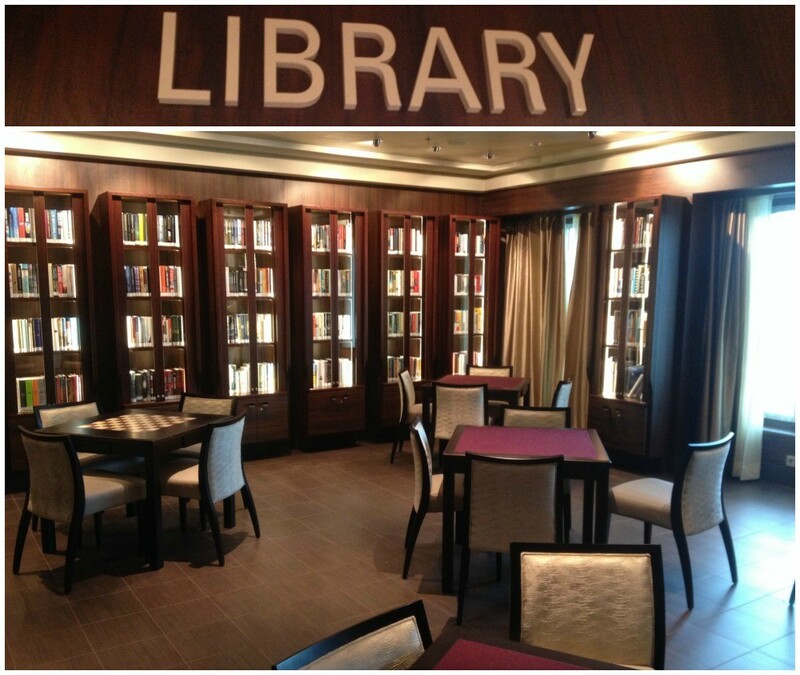 The NCL Escape has 20 decks of which I captured only 14 in this photo. Once through security it was as-per-normal, a photo before boarding at one of the backdrops then the slow walk to the ship. Boarding was nothing eventful which was a little unexpected and disappointing. 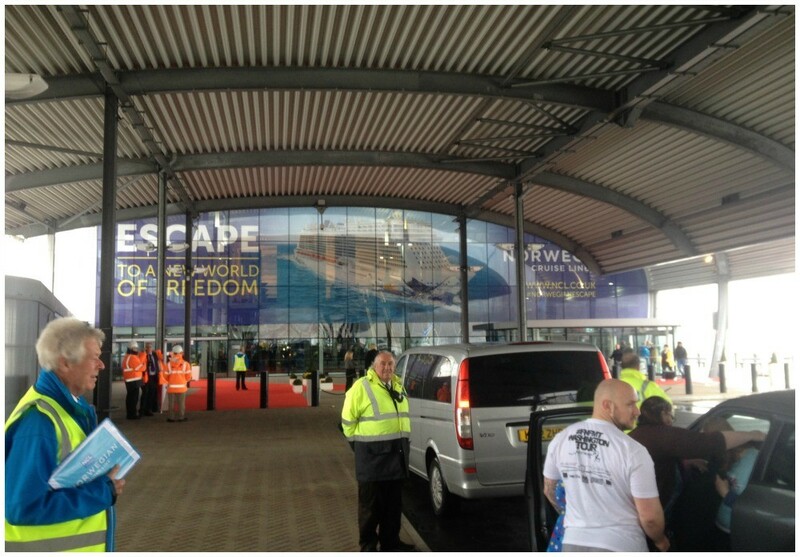 What I mean is, no extra excitement being the first Transatlantic crossing for the NCL Escape, it was all very blasé. 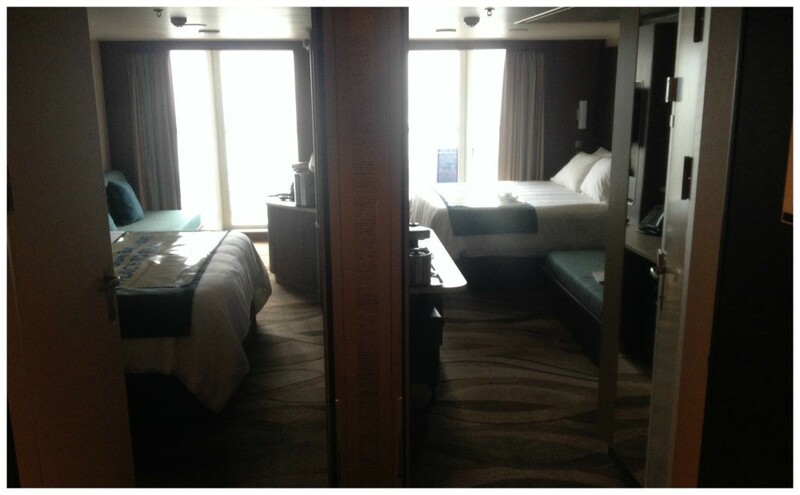 We stepped aboard on deck 5 midship and made our way to the lifts where a staff member asked for our cabin number and instructed us to take the rear lifts. Deck 5 is where you find the kids area ‘Splash’, wooden flooring and a wide corridor with nautical paintings on the walls all very bright and modern. A group of 8 lifts service the aft section and up to deck 11 we rode. 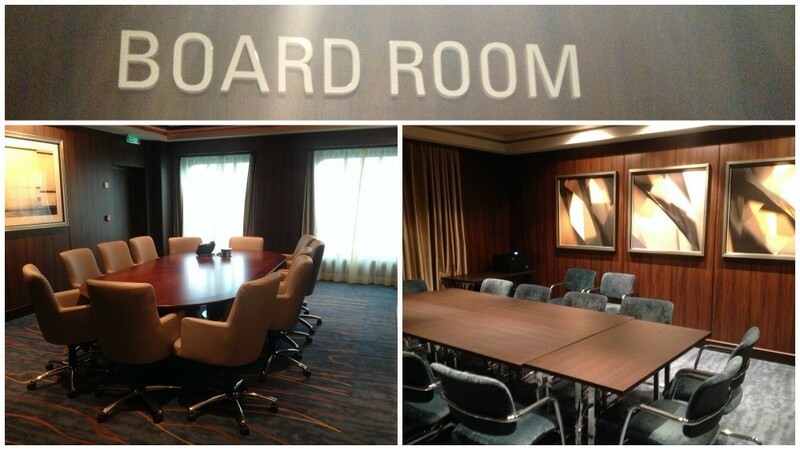 The good thing was that we could get access to our cabin already which is often not the case when boarding early. Walking along on deck 11 to find our cabin you could see into the other cabins as all the doors were open. I peered into some other cabins out of interest, more on them later, before eventually arriving at ours. We dumped our carry-ons and quickly took a look around our cabin before meeting our steward who explained that he needed just a while longer to have our cabin fully prepared so we ventured out. Our balcony cabin had the bed along the window, (please note this is not the same with all balcony cabins) with the layout of our cabin it was perfect as we like our bed near to the window. There is not much room between bed and window but not that we felt cramped, it might be different with the bed near to the wardrobe. 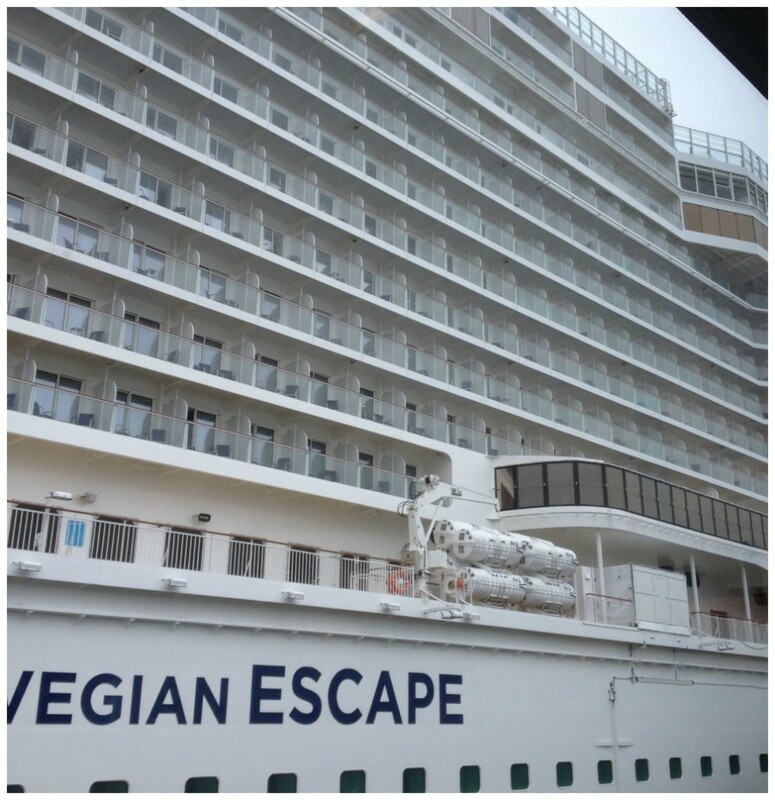 You can see from the photo below showing neighbouring cabins with a different configuration. 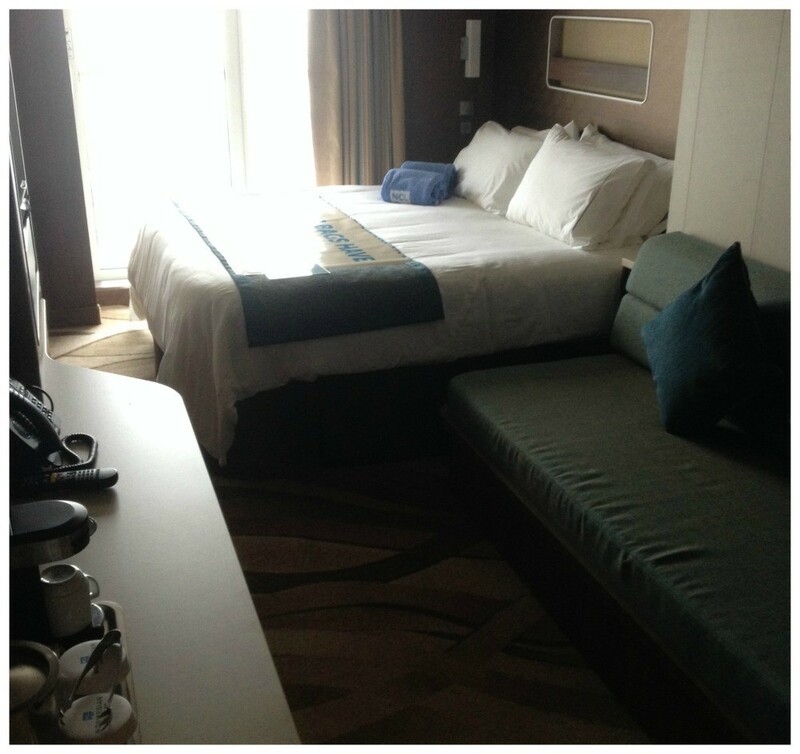 The beds and pillows were very comfortable and we slept very well, why wouldn’t we, were on a cruise right. Another thing to note here is that as the Escape has the “Waterfront” which is where the bars and dining venues are located along the outside of the ship on deck 8 which means that any sounds from there will and can be heard up in the balconies above. The room was spacious around the desk and couch area, with a small square desk seat that tucked under the bench top. A hot water machine is there for tea or coffee (apparently coffee pouches were not delivered in time for this cruise) two tea bags were replaced each time we had used them though. A mini bar fridge with a small selection is built into the cabinet and a couple of cupboards also. The interactive tv is large and hangs on the wall built into the cabin. A huge mirror is there and helps make the room feel even bigger, another floor to ceiling mirror hangs so you can check out the looks when dressing up. The lighting is good and some lights can be controlled by the bedside. For the cabin power to come on you need to place your cruise card into the slot just inside the door. Just inside the door is two switches, one for the Do Not Disturb sign, the other for a Make Up Room, there are no more door handle hanging signs. This panel outside also lights up when you are home. The balcony door is a slide door with lock and works really great keeping it open half way for example, also the air conditioning shuts off if the door is kept open for an extended period. The bathroom is a good size with sink and surface all in one. A couple of shelves to stack items and plenty more underneath as well. The Shower unit is very nice and gone are the hanging plastic shower screens replaced with a one piece strengthened glass capsule and door. The shower is very nice with plenty of space and the water stays in the shower and not over the floor. Standard soap and shampoo are in pump dispensers, the towels can be re hung or changed daily. A hairdryer is also available. Missing are any extras like cotton buds, creams etc, not that its the end of the world, also there are no bathrobes in this balcony cabin. I think they are only in the Spa cabin class and above. 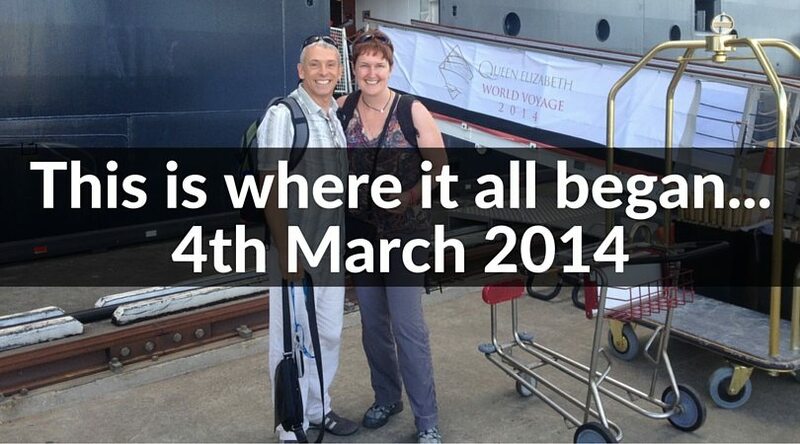 This is the biggest ship we have been on so far and you w do lots of walking. 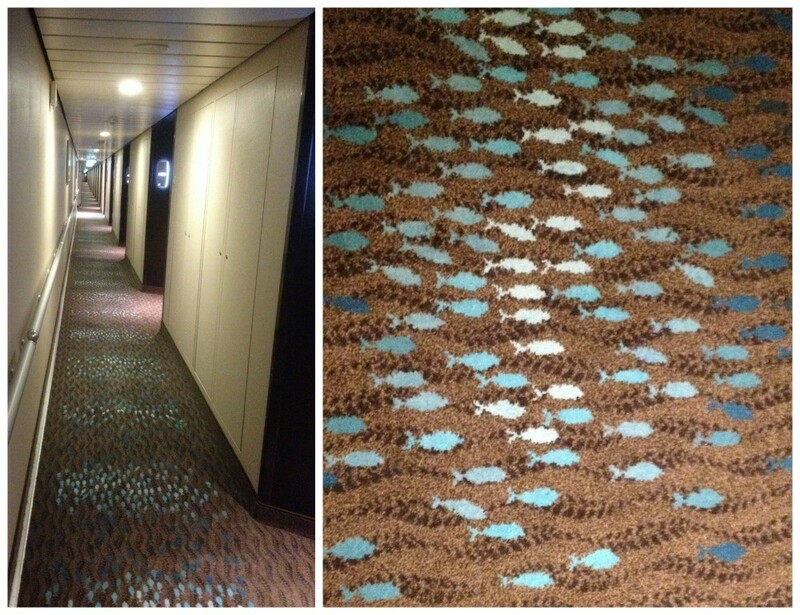 The carpets in the accommodation corridors have fish on them and these fish are swimming in the direction to the front of the ship so you know which way to walk. I had booked this cruise 6 months ago and when I wanted to book the UBP (Ultimate Beverage Package) however on the Transatlantic cruise it was not allowed, I found out that this must have changed as many of those that got a deal from the UK had the UBP included in the package, never mind. 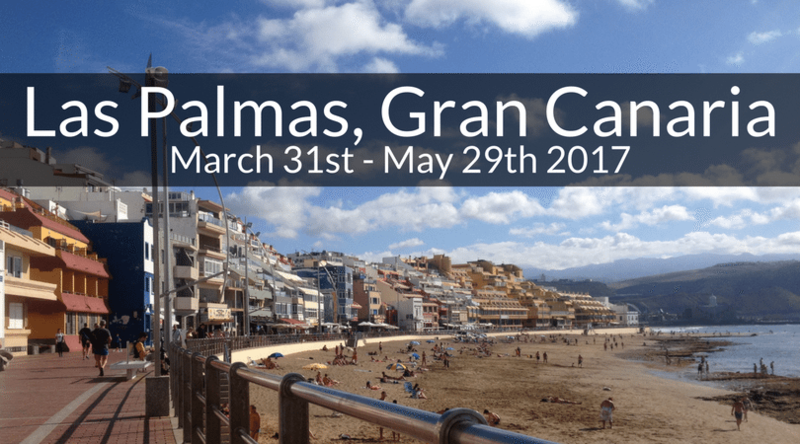 Our cruise fare included the UDP (Ultimate Dining Package) which included unlimited visits to 6 of the speciality venues. Let me just mention something about the dining onboard. There are 28 dining options, (not all restaurants) some of which require reservations and charge extra person individual prices or a set fee. You could make any amount of reservations on embarkation day from various booking stations at restaurants, after that you could always make a reservation at the desk just to the left of Guest Services in the Atrium. A word of warning, the speciality restaurants book out very quickly especially the steakhouse “Cagney’s” and the french restaurant “Le Bistro“. 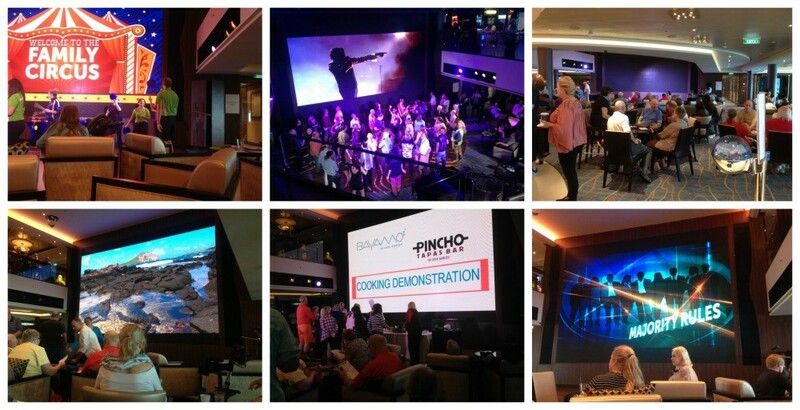 Each venue has multiple time slots available and there are screens around the ship show the availability of each venue and time. Having said that, we just walked in without reservation knowing that the restaurant was showing no availability, I guess, if you want a particular reservation time then book early. According to some other reviews that I have read they say if you don’t want to go hungry be sure to book up, we never had a problem like that. Most of the restaurants had a line of people waiting to get in, even those with a reservation have to line up as you need to scan your cruise card before entering each venue. 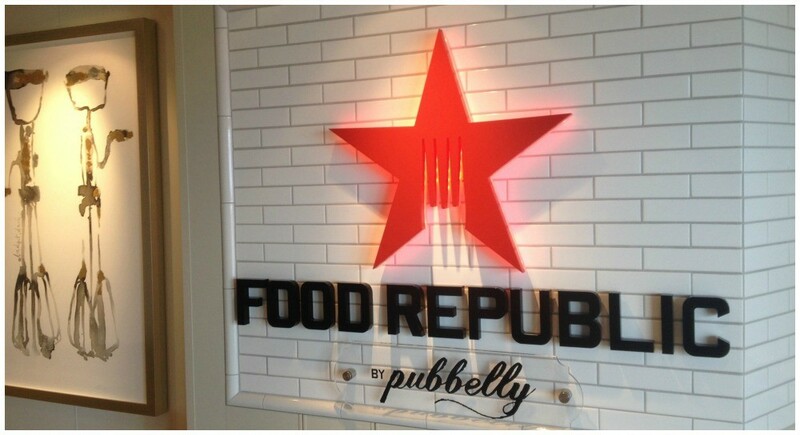 I go into more detail for the venues that we experienced in my individual restaurant reviews, just follow the links. The emergency drill which is compulsory was very smooth. You do not need to take your life jacket with you which is really good. At your assembly point we were scanned in with our cruise cards which really helps to make sure that everyone attends and it saves the time on trying to do a head count manually checking. The drill was short and sweet, the quickest drill of any ship and included a demonstration on how to put on your life vest. Each night the ‘Freestyle Daily’ which is the Escape’s program of events is delivered to the cabin. 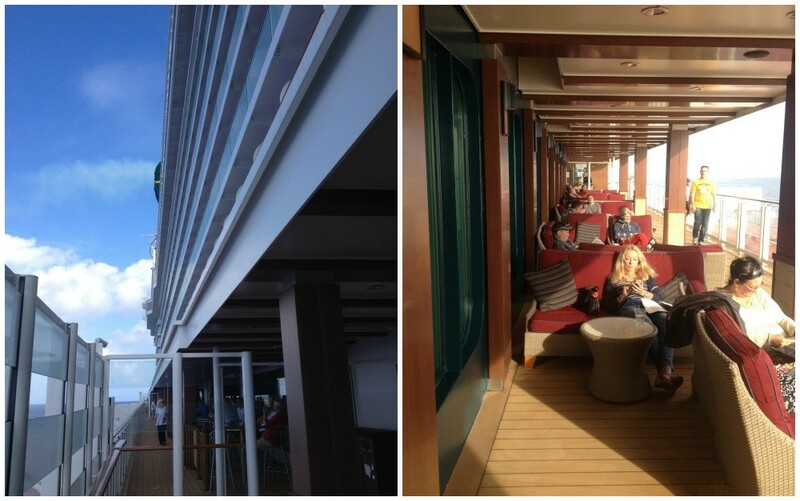 Each of our other cruises we’ve done have the same thing just done slightly different. This program didn’t excite us much, it was very much the same each day and when that’s the case nothing stands out. I feel that these programs need to have a face-lift. Sure enough, the list of things to do was long and you could plan your day accordingly but I just didn’t get inspired from it. On the Saturday morning (day 3) when we woke up, the navigation map was showing a change in course and soon the captain gave more details over the public address system, we had changed course to accommodate a medical evacuation by helicopter near to Spain. The Atrium on the Escape during this transatlantic cruise was very very busy, to the point that it was crowded and it lost the feeling of comfort and relaxation. This was probably due to the poor weather and having most guest activities hosted here. 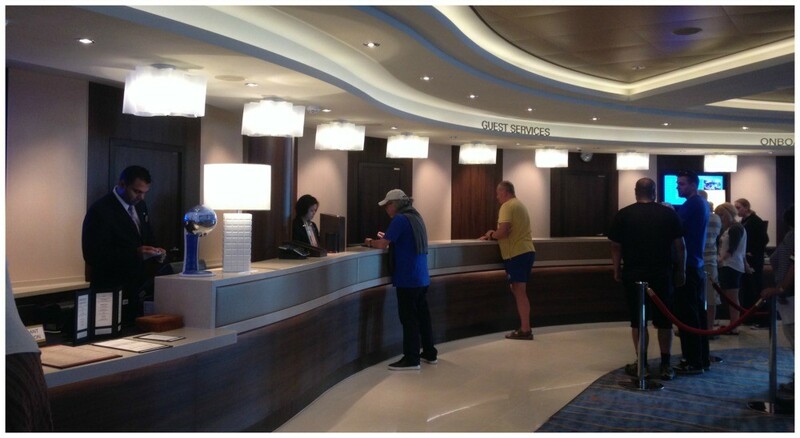 It is a very large and open area that spans the width of the ship, on one side you’ll find the guest services desks, dining reservations desk, the Internet area and the future cruise consultants desk. The Internet cafe without a cafe (is a long way from the cafe), the Atrium Cafe is situated in one corner of the Atrium the Internet place in the other. i-connect has 8 computers set up in little booths, and also some chairs with plenty of power points to stay plugged in. We found the connection to be quite stable for the majority of the cruise however, the last day it was not working for many hours but finally came back on late in the day. Many passengers were whingeing about the internet being slow, I’m not sure what they expected in the middle of the ocean. 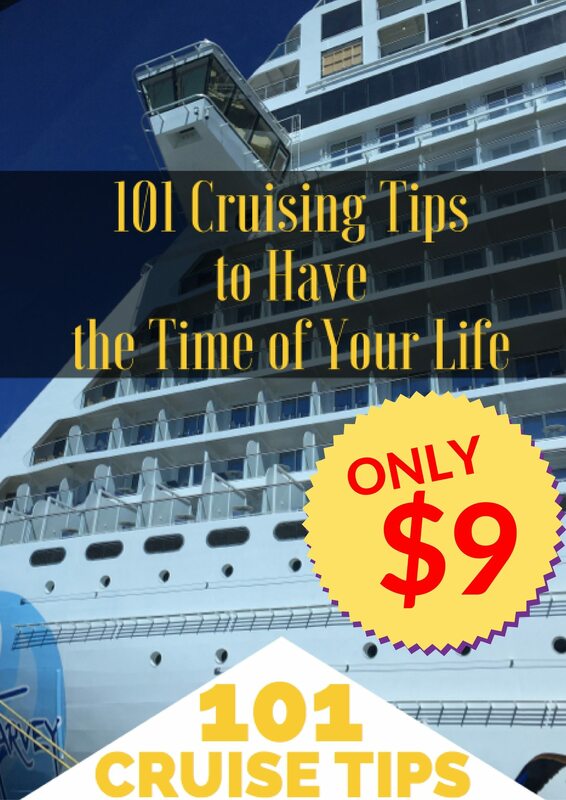 The prices were not cheap with the best price being $29.00 a day and must be taken for the duration of the cruise, totalling $299.00 for the ten days. 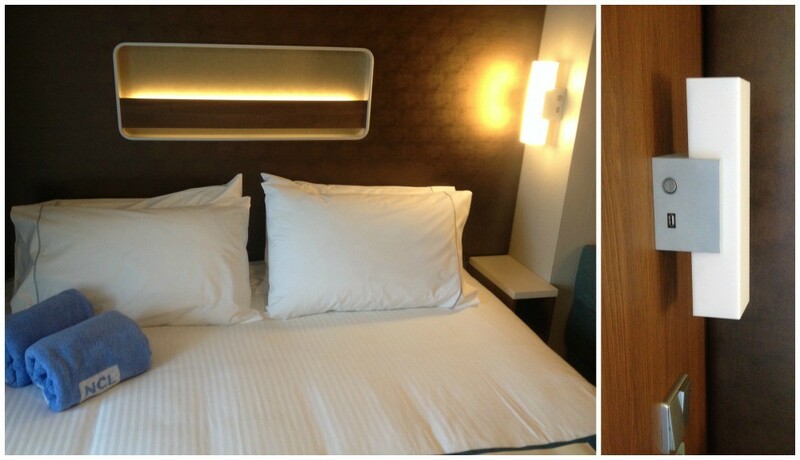 We chose the next best package which was 250 minutes for $125.00. Looking out from the i-connect, on the other side is the Atrium bar and the Atrium cafe. and then there are more bigger softer chairs around the dance floor area as well as a few couches and tables. As I mentioned this area was always full and made finding a seat a nightmare. As for the service, once you managed to sit down, it was near to non-existent. The cafe is more of ‘an order and wait’ kind of place a bit like Starbucks or Costa coffee which is really a shame, and hence the majority of beverages served here were takeaway coffee as people had nowhere to sit and enjoy them. The coffee used throughout the ship is Lavazza and the coffee itself was not bad. Priced at $3.48 for a latte or cappuccino, you’d want to be able to sit and enjoy. The Atrium bar which is next to the Cafe was busy every night and also during the day for the first week due to bad weather, but once the sun came out it was much quieter. All of the trivia events were held here in the Atrium and also other activities but it was mostly trivia or trivia. They did show a few movies on the huge screen as well as the Rugby World Cup final. A ship with this many passengers needs as many seats as possible. What happens though is that the serial trivia playing teams set up camp and that is why you can’t find a seat to enjoy a coffee or drink. A good thing here is that you can also watch and partake in the events from the O’Sheehan’s bar above which looks down to the dance floor and screen. 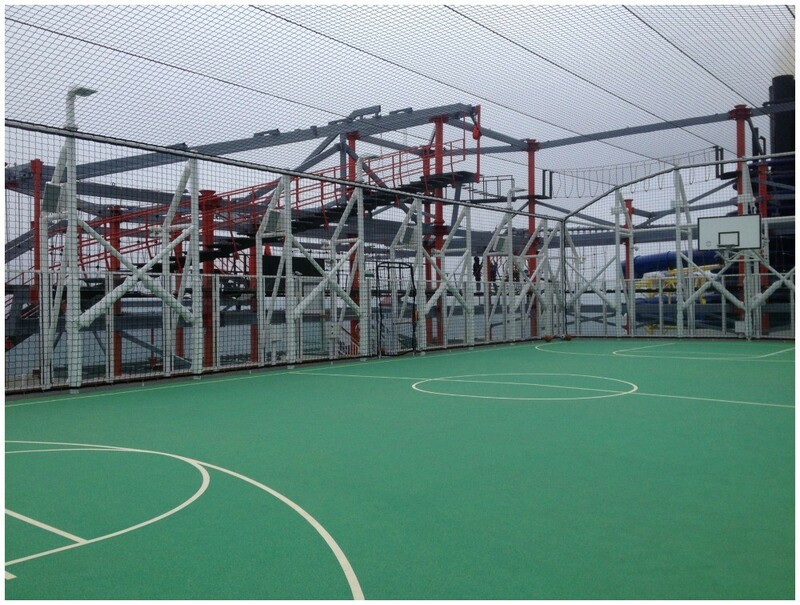 The Atrium is located just forward of the centre of the ship, you can get to it via the main walkway. 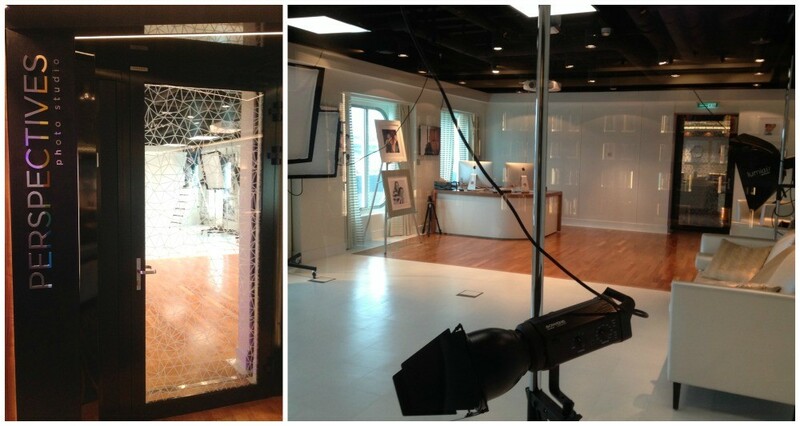 Just off of the Atrium going forward you can see Perspectives Photo Studio and next to the Photo Studio is a glass door that leads to the Library and Meeting Rooms. 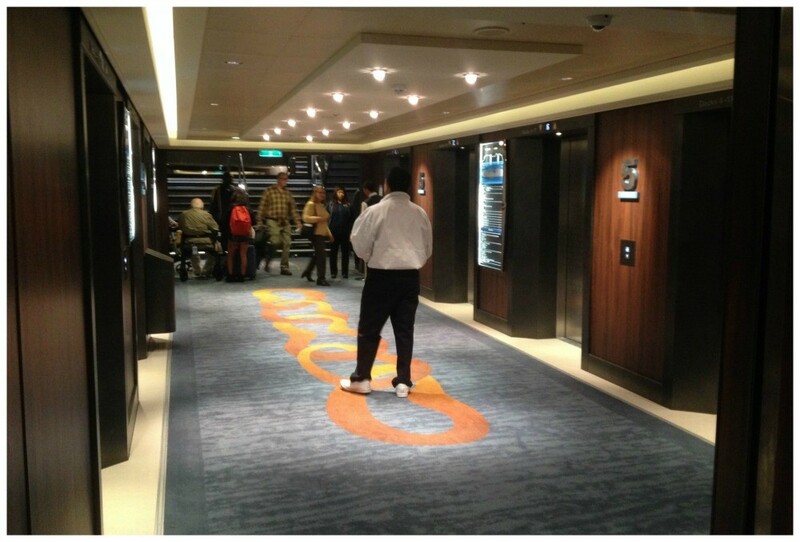 When walking towards the rear of the ship you continue along ‘Ocean Place 678’ which takes in decks 6,7,& 8. 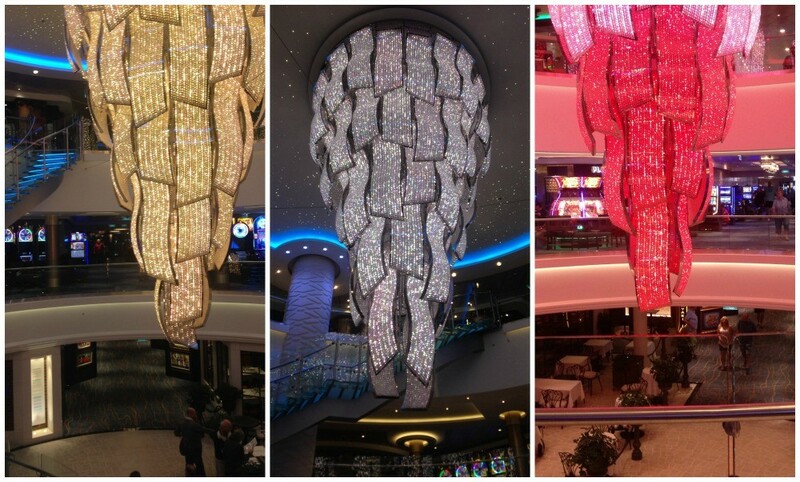 This Atrium area is quite nice with the focal point being the huge light structure hanging from the ceiling of deck 8. This light changes colour and sets the mood of the day or night. The glass stairs also light up which go from deck 8 to deck 6. 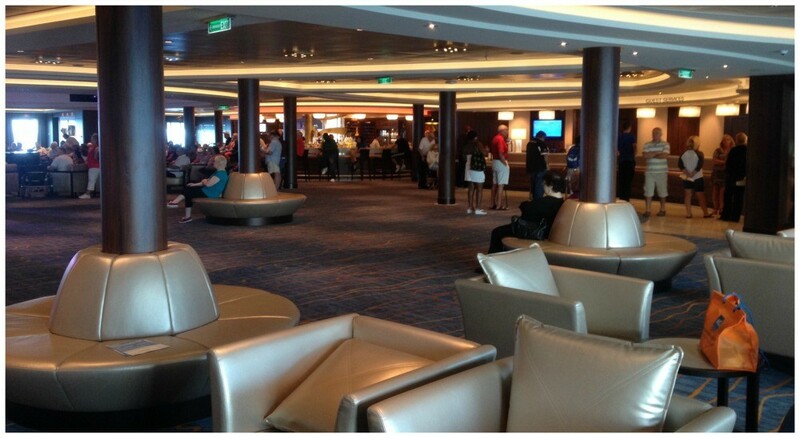 The casino on the Escape is one of the largest and spacious at sea. 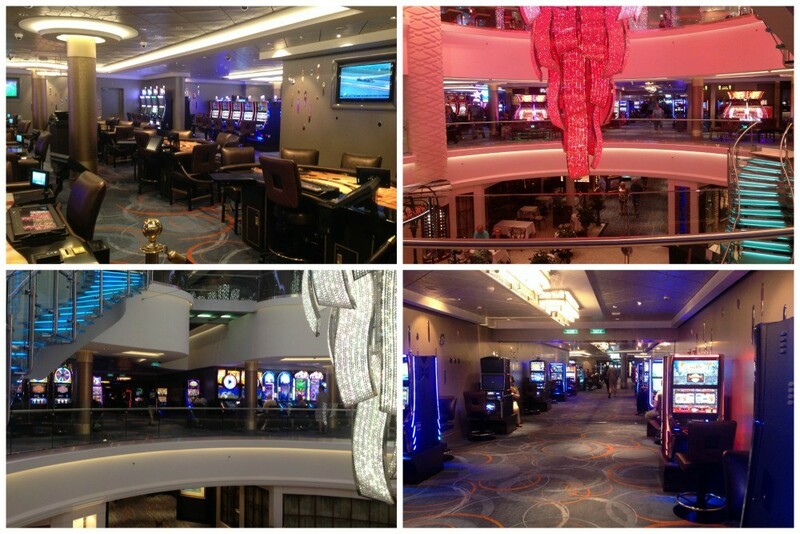 When walking from the front to the back of the ship or vice versa on deck 7 you will walk through its wide corridors lined with casino machines. The bulk of the casino is however behind the corridor and around the atrium overlooking the decks below. The casino is also smoke free and the ship, the guests and most of all, the staff will be very pleased about that. This bar is probably the biggest on the Escape, it’s opposite the casino and has live music most nights, with comfortable seating and nice lighting. The tv screens show some sports during the day and skyline pictures cover the walls. 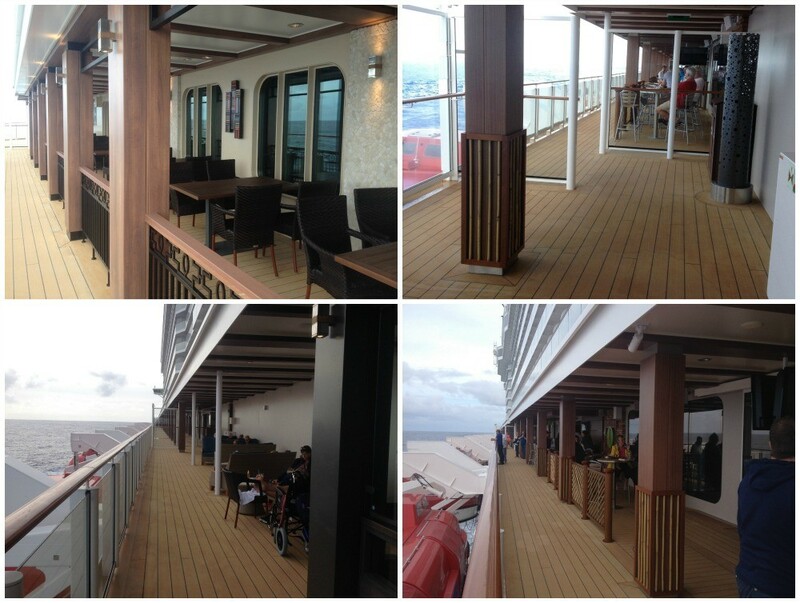 This area is for Studio cabins only and is situated on deck 11. It’s funky colours and round windows that look out on the corridors and wavy carpets give it a psychedelic feel. 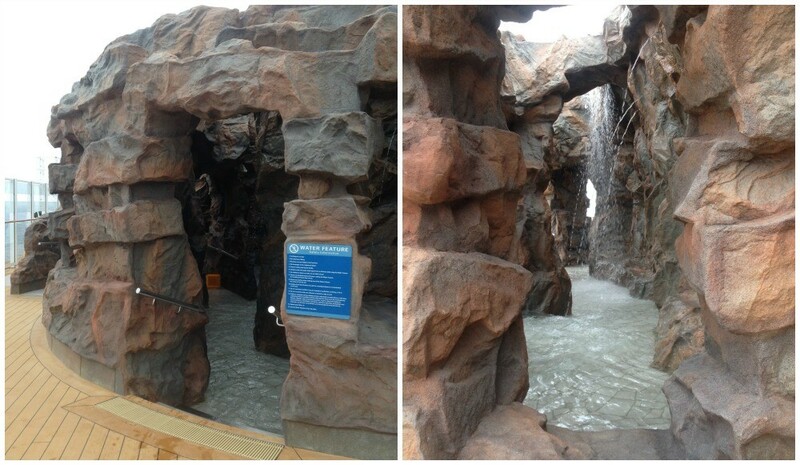 The area is special keycard access only (don’t ask) but I managed to get a glimpse at it. 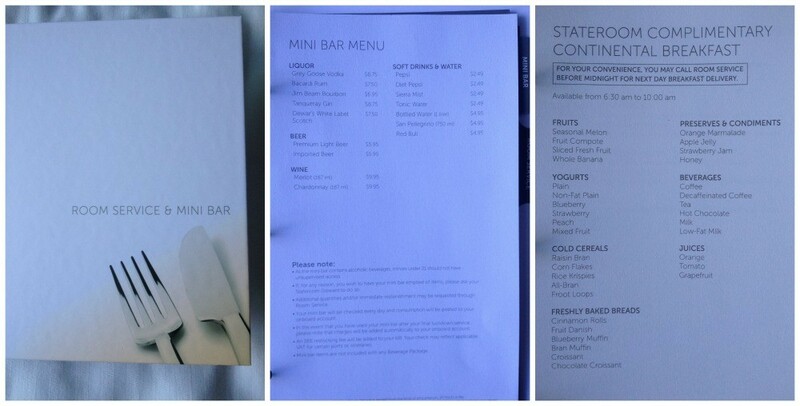 Some of which have a cover charge and are not included in the Ultimate Dining Package. The first night we chose to eat at the Teppanyaki restaurant. If you have never experienced a visit to a Teppanyaki place then definitely give it a go and enjoy the show. Yes it’s more a show than a gourmet dinner but enjoyable for sure. We enjoyed a bottle of Chardonnay with our meal of beef fillet with scallops and lobster with prawns as well as the entrée and deserts. This is the wine list onboard the Escape. These meals here are ala carte priced and our three course dinner for the two of us would have cost $68.93 plus 18% service charge. Our reservation was for 7.30 and we were shown to a nice table along the wall inside. Some tables are located near the entrance and opposite the 5 o’clock somewhere bar where it was noisy from the music and karaoke singing in there, not exactly what I want to listen to at dinner. La Cucina is an Italian restaurant serving some classic dishes among others, this is not a pizza, pasta joint. La Cucina is also available for waterfront dining. These meals here are ala carte priced and our three course dinner would have cost $60.94 plus 18% service charge. This is the French restaurant on Escape which also has seating on the outside of the venue, a bit like street side dining. Being on deck 6 Le Bistro does not have any outside ‘Waterfront dining’ which I guess is the reasoning behind the cafe style tables and chairs in front of the restaurant. It really doesn’t work for me, it’s either fine dining or cafe street side style! The Bistro it is actually very small inside with hardly any room between tables. It was very busy like every night and no wonder it books out quickly. The menu is classic french and individually priced. The meals were lacking any wow factor and actually rather poor in presentation and quality. Service was also not what you’d expect in a fine dining venue and I will say that it was due to how busy the place was which is something that the staff are going to need to discuss to make it a better restaurant worthy of it being the fine dining French restaurant. The Moderno is the Brazilian style Churrascaria restaurant. Here you’ll find a center salad buffet which is self serve while the meats are brought to your table and carved or served for you and you can have as much as you want. A red and green sided disc will tell the Gauchos (waiters) that walk around with the skewers if you want meats and when to stop. A choice of sides also come out and with the meats, and dessert is also available. The buffet has a good selection of salads and includes soups as well as sushi. We enjoyed the salad and some of the meats. The sides were a bit average as was my dessert. The service is fine, but just lacked some personal appeal and we felt like we’d had a meal but couldn’t get over excited about the evening. The restaurant was the least busy of all venues that we tried. 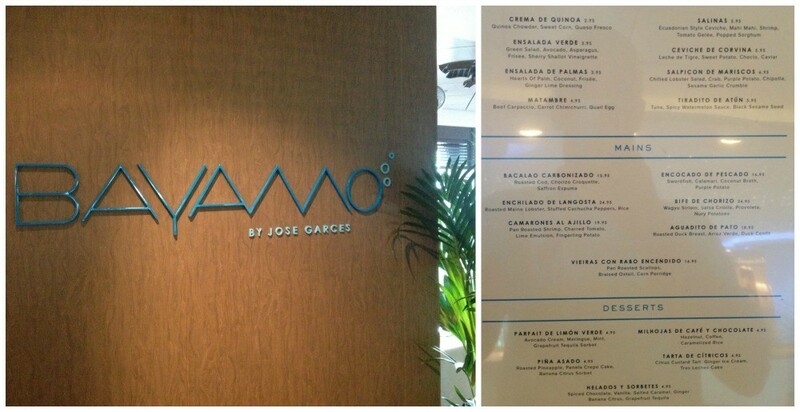 Moderno is also available for waterfront dining. 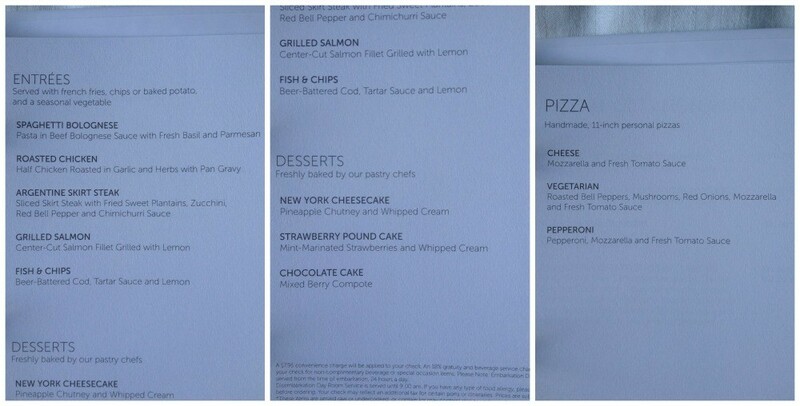 These meals here are a la carte priced and our three course dinner would have cost $64.00 plus 18% service charge. The steakhouse called Cagney’s was busy every night, just like Le Bistro. We had a reservation for 6pm and at that time we were both not hungry, also we had a booking for the show at 7pm which would have meant us not being able to enjoy the evening. Tip here… when booking your dinners be mindful of your show reservations or vice-versa, neither of the two systems work together so like us you could end up with an overlapping reservation. We chose to skip our early reservation and enjoy the show before going to Cagney’s at around 8.15pm hopeing to get in. We had no problem at all and were shown to a table. The menu is large and has other items apart from steak. We ordered with a very competent waiter and once again enjoyed some wine. Service was very good and the meals also. The starters, steaks, tuna and the desserts were all wonderful. Actually the steaks were fantastic (we enjoyed a second dinner here, again awesome). The ambiance in Cagney’s was relaxed and enjoyable, with tables at a reasonable distance to others, if you’d like a romantic dinner then this is the pace to go. Cagney’s is also available for waterfront dining. 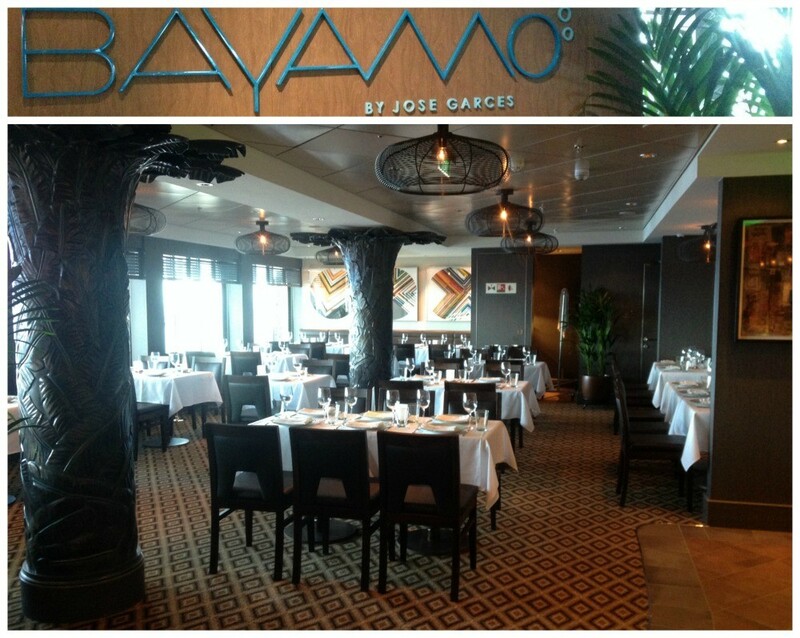 There are three main dining rooms on board the Escape, The Manhattan Room, Savor & Taste. 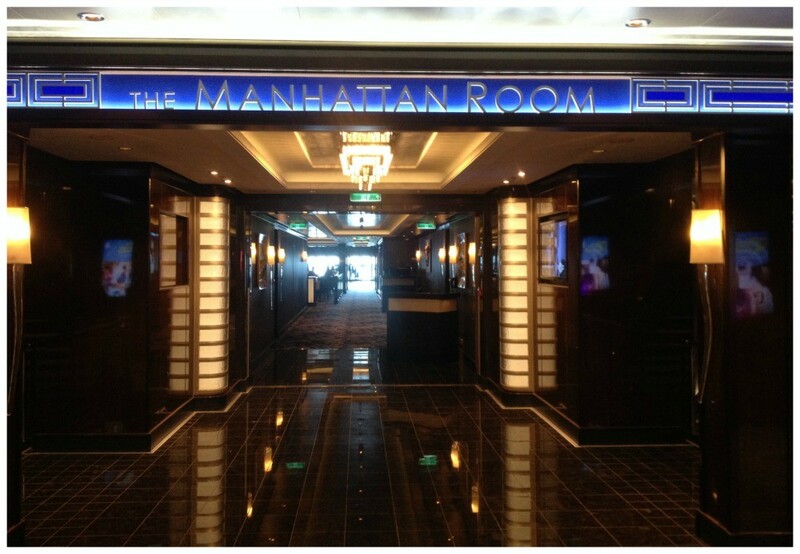 The Manhattan is what you would classically call the main dining room. It has a large dance floor in the middle and lots of tables front, right and left. There is live music played during dinner from the stage at the very back. During the day this room is filled with light from the huge rear windows. The music is rather loud at times which is not ideal for table conversation, but if you’d rather dance between courses then it might suit you fine. The menu is quite small and basic with only a few classics that don’t change, the rest of the menu changes. The quality of food and service were both in need of a lift. Service ok but not very personal or attentive, the food lacked finesse and quality. The following are the five complimentary venues on the Escape that are open for lunch, there are for more that have a surcharge. 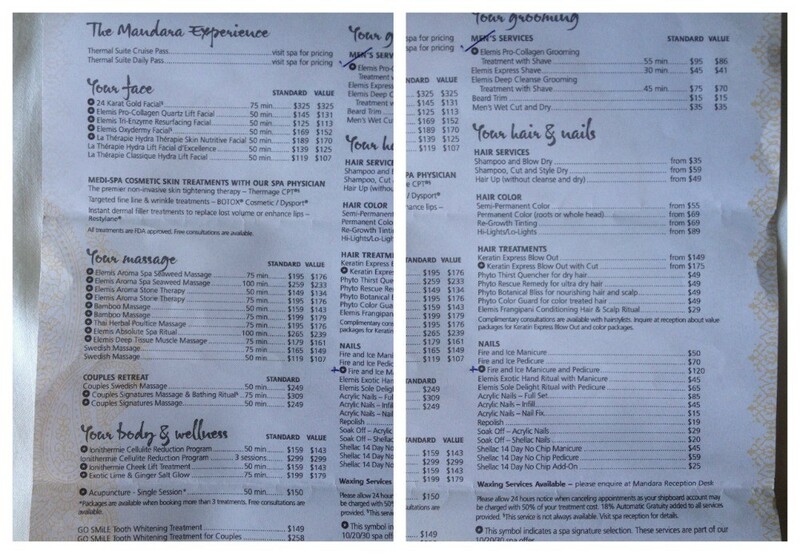 These two restaurants which are also classed as main dining rooms, have the same menu as in Manhattan. 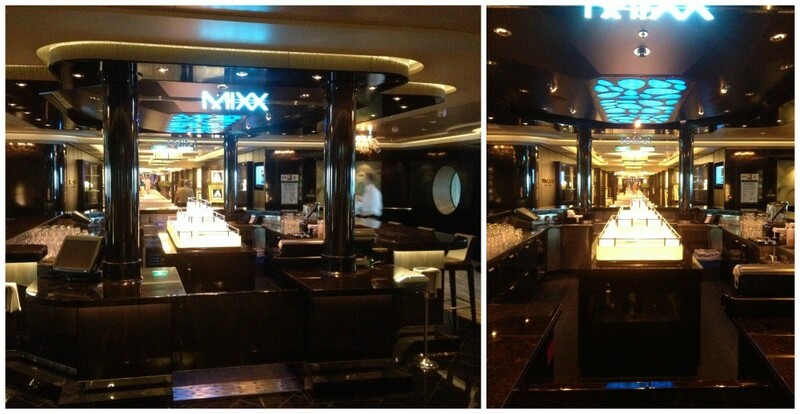 They are situated on either side of the ship and smaller than the Manhattan. Service is slightly more personal here but the food the same as the main dining room. Breakfast is served in both Savor & Taste but not in the Manhattan. Lunch in these restaurants was fine and they close at 1.30 on this cruise which we found rather early. The lunch meals were good and we enjoyed two visits, sadly the menu was the same each lunch and not very extensive either. There is a downstairs part to Taste which was not yet in use, but apparently will be used when the ship is full is known as The private room at Taste. This venue is above the Atrium and open 24 hours. We had lunch here on a few occasions at different times during the day, the menu stayed the same all day. The place is like a pub venue and so is the menu, rather lacking in choice though. Service was good here even though they were nearly always busy. The food was fine, nothing amazing but tasty and we enjoyed our lunches each visit. There is a games area located near to O’Sheehan’s Neighborhood with a pool table, small bowling ally, dart boards, basketball games etc. The Garden cafe is nice and open, it has a clean streamlined feel to it. Tables are rather close to each other and it was very busy at meal times, so finding a table could be a challenge (like most buffet venues on cruise ships). The service (the clearing of plates etc) was very good and not once did we see dirty tables for more than a minute. The food selection at each meal time was very good. Breakfast was by far the most hectic no matter what time you went, probably because of the amount of time it took for breakfast service in the other venues. We waited for a longtime the first and only time we chose to have breakfast in Taste. Even though the food and service were ok, we found that the buffet had a larger choice and getting your food from the buffet was easy. The buffet repeats itself three or four times as you walk around and once you know where to find your favourites it is easy and enjoyable. This place was very quiet due to the poor weather, but as soon as the sun came out for the last three days it was packed and you waited up to an hour for your table. The meals and service we had were fine. Not something that I’d need to rush back for but obviously very popular with the burger crowd. On a hot Caribbean afternoon it will probably be the place to be especially as it is complimentary. 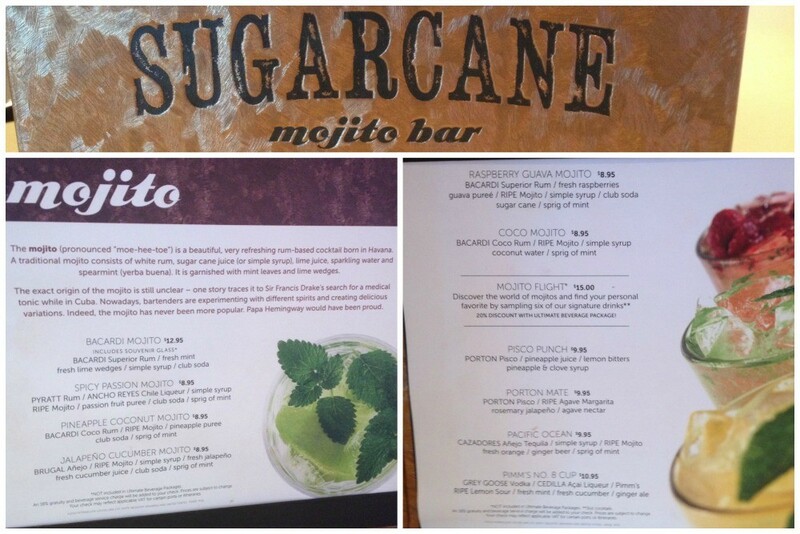 Cocktails and drinks that you’d expect at a Jimmy Buffett place were flowing to those with the UBP. 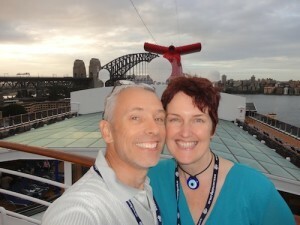 We didn’t experience any room service on this cruise due to the many dining options we had. Room service continental breakfast is included in the cruise fare, everything else incurs a $7.95 service fee. The cooked breakfast menu choice could be improved. This is a tiny place where you could buy muffins, cupcakes etc and also get a take away coffee. 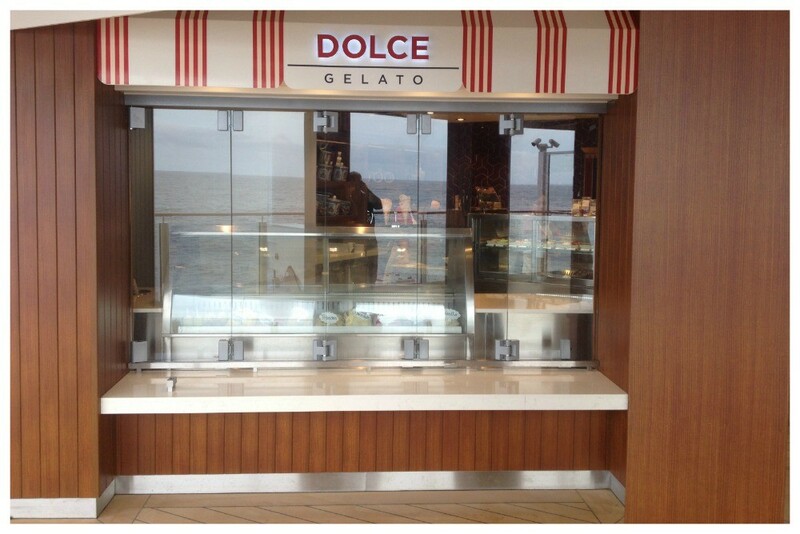 Is in the same place as the bake house just with the ice cream display facing the outside on the waterfront. This venue also has waterfront dining. The ship has many bars to make the best pub crawl ever, but without a drinks package you probably wont. 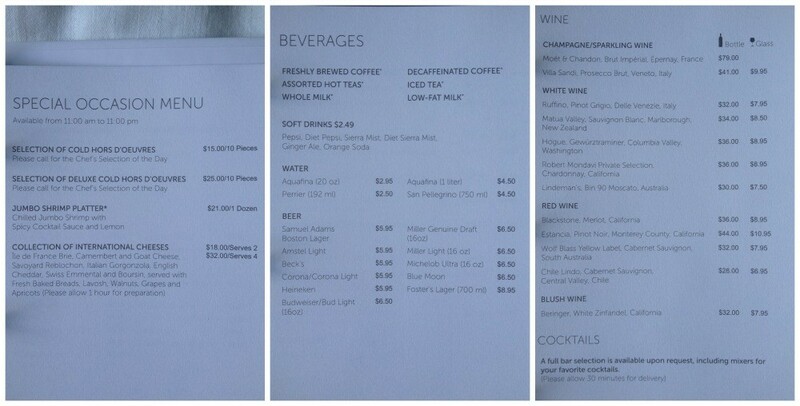 The prices of the drinks are on the expensive side especially when you have to pay the 18% on top. 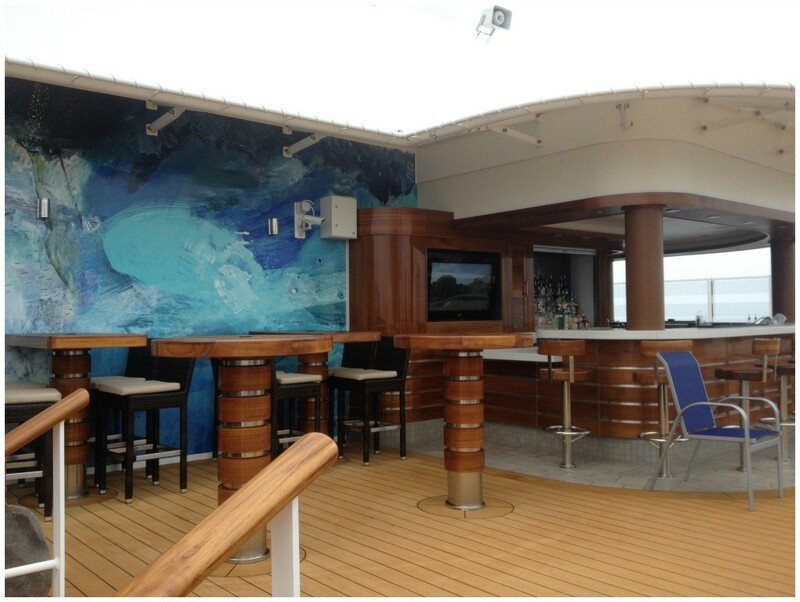 A UBP at $64 per person per day would only work out if you really wanted to drink your way around the ship. A cabin of two would be $128 per day and that’s a lot of drink. Saying that, if you were fortunate enough to have it included in your fare then enjoy it to the max. If that means having a champagne cocktail for breakfast (yes I did see them on a couple of days) and that’s your thing then no one will stop you. 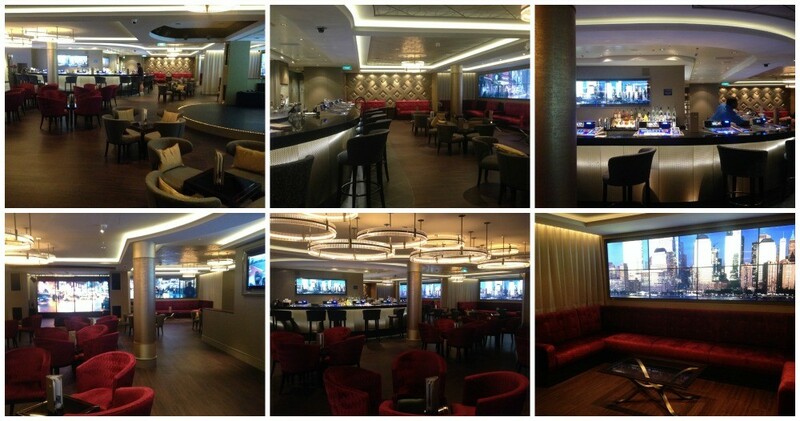 As for the bars, the Atrium bar as I mentioned earlier, was very busy during this transatlantic cruise, definitely due to the weather not being great for the first 6 days and so it was constantly packed. Just next to the Atrium bar is the Atrium cafe. Here you can place your order at the counter and collect the beverage to the left, rather sad that the service here was like that. Table service was very limited, I’m going to say probably because it was so busy, but maybe not. The seats at and around the cafe area were again limited and the cafe doesn’t have a nice cosy feel to it at all. Also no coffee voucher for the coffee addicts so full price each time, as for the quality of the coffee’s well, not great but not the worst. we only had one a day where as we could easily had three a day if they were great. O’Sheehan’s bar which is directly above the Atrium bar area which can be viewed from the glass sitting bar around the top. This was also very busy and you could also eat meals from the O’sheehan’s restaurant there as it is just off the bar. There is a games area or arcade to the other side of the bar with a few pool tables, a bowling ally electronic dart boards and some other games. A sophisticated look and appeal to this bar, but lacks good seating and atmosphere. If you enjoy your beer then this is the place for you. With 50 bottled beers and 24 drafts you can be sure there’s one or two that you’ll enjoy (if they have them that is) not all were in stock. The District Brew House beer menu is vast and the venue is decked out tastely as well. They have live music here in the evenings. 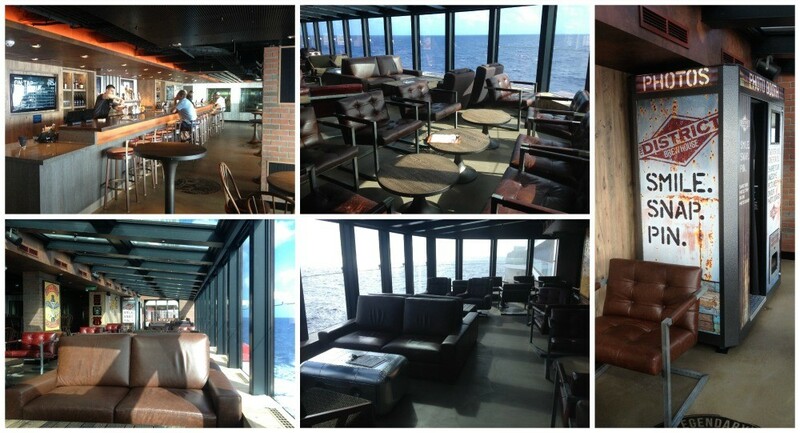 Deck 8 waterfront outside area as well. This is a nice bar with good mood lighting in the evening. It is quite busy as it’s right near the cigar smoking room and also it opens out onto the waterfront where the bar and service is continued plus the smokers, so each time the door opens in comes a waft of smoke. Drink service here was pretty good but one thing we missed were some chips or small snacks canapes with drinks. The decor is a replica from the Original Tobacco Road bar that was in Miami. When looking at the specs for the Escape this was one of the areas that I was really excited about. Unfortunately the weather was not ideal and we didn’t get to experience the waterfront at its best. 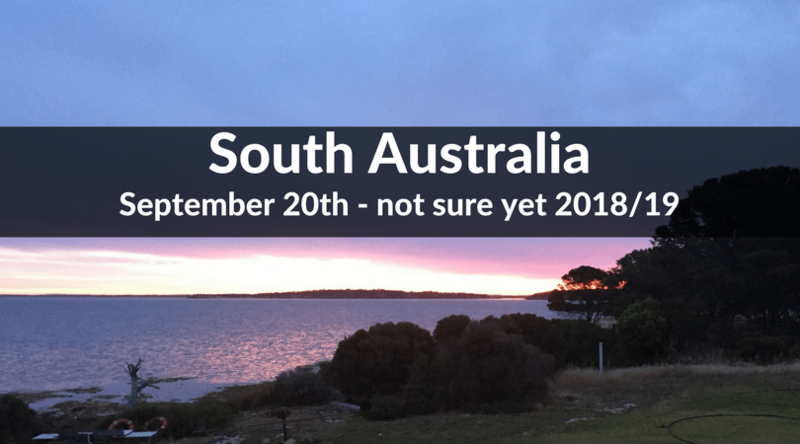 I do expect it to be a hit though in the warmer climates enjoying a drink and dinner out on the waterfront. Just sitting here during the day with a beverage was wonderful, not as hectic as the normal outside pool deck areas and with comfortable chairs on the few sunny days it was busy. The theatre was a real surprise. 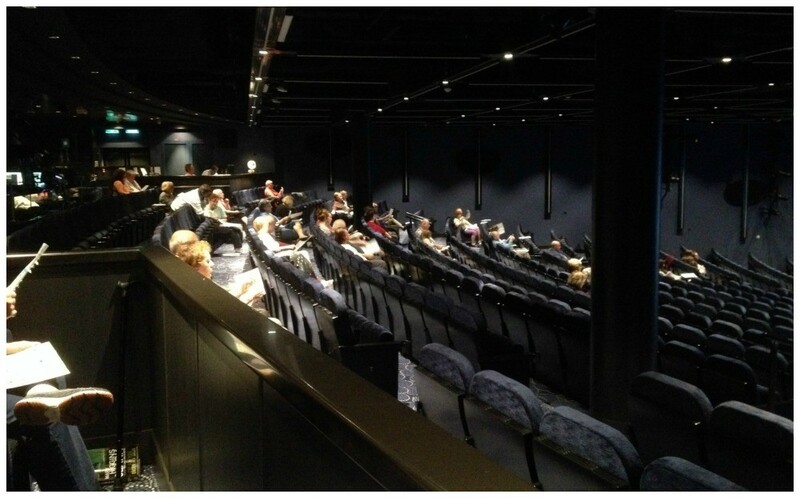 Most ship theatres can accommodate roughly half of the passengers give or take a few, this one certainly not, however there is another theatre, the ‘Supper Club’ which has different shows at the same time. Imagine a very large cinema and that’s what this theatre is like, no bling or balcony level. The seats have drink holders and you can have your drink order taken at your seat, it is very tight and can be annoying to other guests in your row. The seating is not the most comfortable either. The shows that we saw were fantastic actually the best ever on any cruise. Unfortunately the sound from the Supper Club below which also has a show radiates through the theatre floor as a boom boom which is not good, apart from that all was good. During the day the bingo was here and a few matinée shows. This venue is located below the theatre and is a half-moon shape where they have dinner and show. 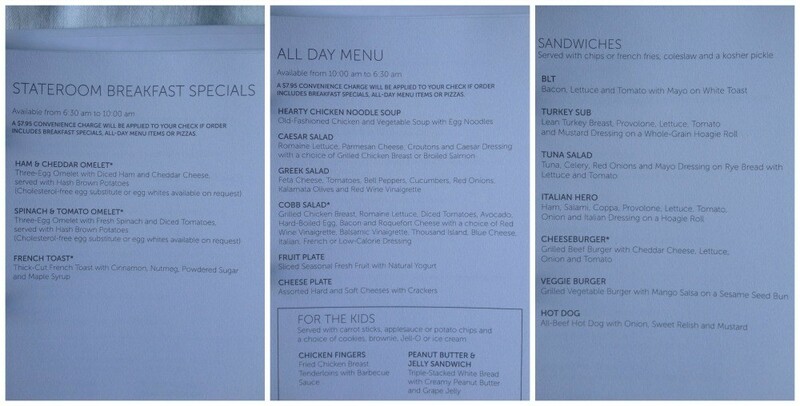 We saw the Brat Pack which has an extra cost of $29.95 plus 18% all up $35.14 per person. It includes the show and a three course dinner and was totally worth it, the show was fantastic and well combined with the service of dinner. Bookings for most shows can be made at the box office which is just outside the Supper Club and open at listed times. The shows did start to sell out quickly on the first few nights so decide quick and book. 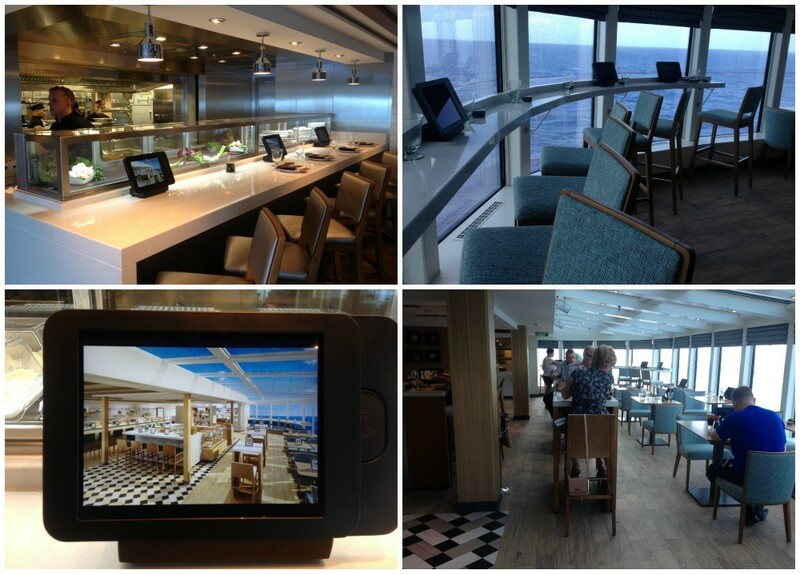 You could also make a reservation on any of the touch screens around the ship which are easy to use. Other shows are available which we didn’t see but were recommended by people we met. The daily program listed everything to keep you as busy or not as you wanted. 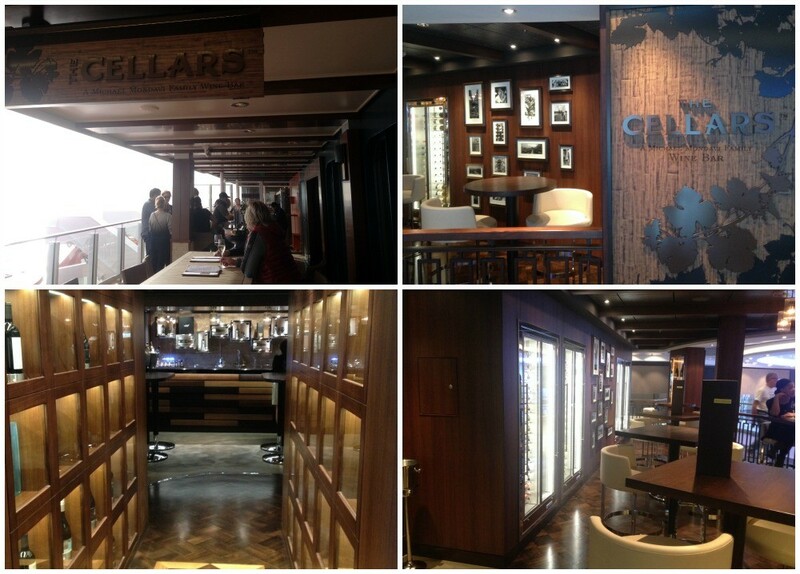 There was no Galley tour which was disappointing as it would have been great to see a brand new galley. 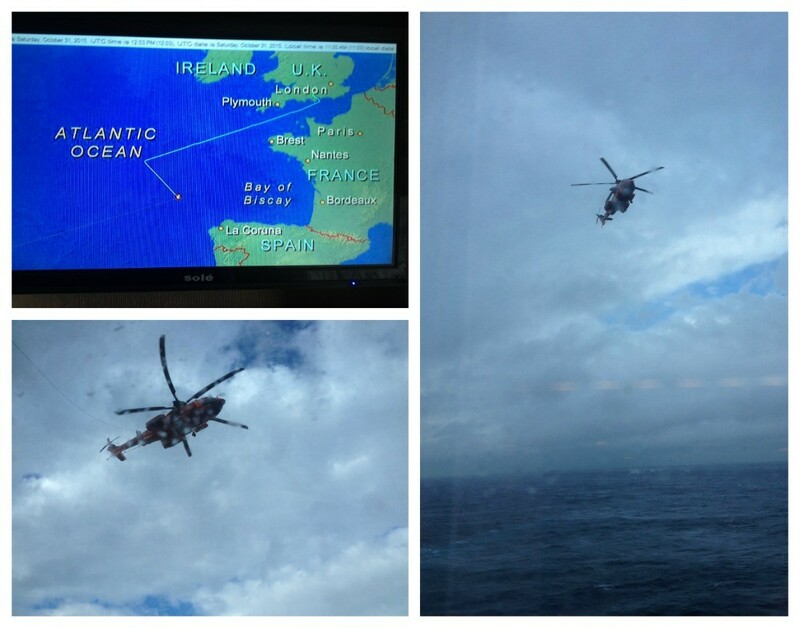 There was a lot going on, but being the transatlantic crossing I expected some more variety during the day especially as the weather was not real great, (maybe just me) saying that, if you loved trivia then it was perfect for you. Trivia was on everyday and not just once, maybe three times!! Then some family circus show spinning plates and yoyo juggling stuff, movies, bingo, ping pong challenge etc. The future cruise presentations were done ok rather rushed. Did I miss something? Oh yeah, Karaoke, Deal or no Deal and more. Some craft sessions in the Tobacco Road bar which was actually not the ideal place either with no tables to craft at and not much space. Something that will need a look at on future cruises. This is where they hold the art auctions during the day and at night it becomes the venue for various comedy shows of which were very good. 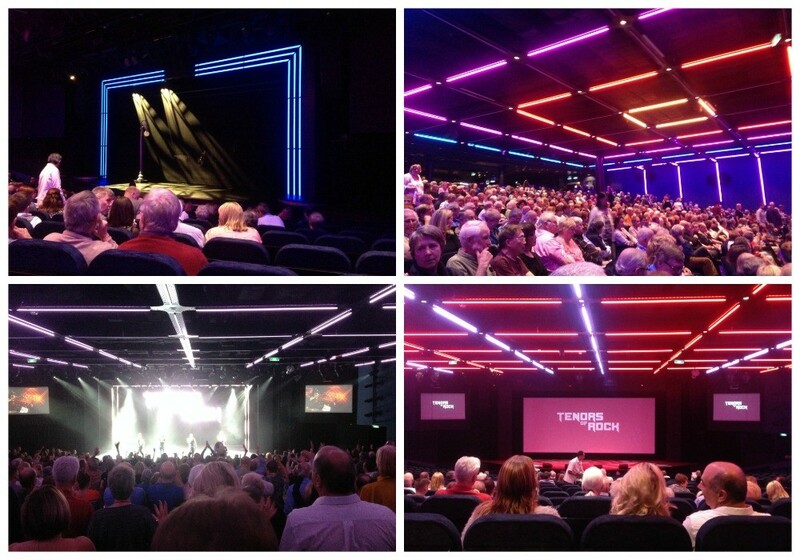 These are also on a booking basis which is good to allow a new crowd to see the show as they are often twice a night. Side note, (warning here) not all comedy is funny to each of us. On other nights after the comedy acts there is the Howl at the moon Dueling Pianos where two pianists play any requests apparently there isn’t a song they don’t know. This drew a crowd for a sing along and a drink in a pub like scene. Located up on deck 16 forward and has very nice views even the gym. This is one of my pet hates on most ships that locate the spa and gym here, taking up the prime space for a great bar location. I’ll never understand why people in a gym need a view, the same goes for the spa and treatment rooms or maybe people want a haircut with a view! We took a walk around and yes it is nice, but in my opinion the steam room, salt room etc are all very small, I don’t think 10 people could be in there. Actually a couple of people we spoke with asked for a refund as they found the Spa to be very crowded and the lounging relaxing chairs all occupied all the time. We were told that a limit of 120 people would be allowed to buy a spa pass at $299 for the cruise. They do have a snow room which I have not seen or experienced before but we chose not to spend nearly $600 for us to try it out. The hydrotherapy pool did look inviting as did the warm fixed beds around the front of the spa. 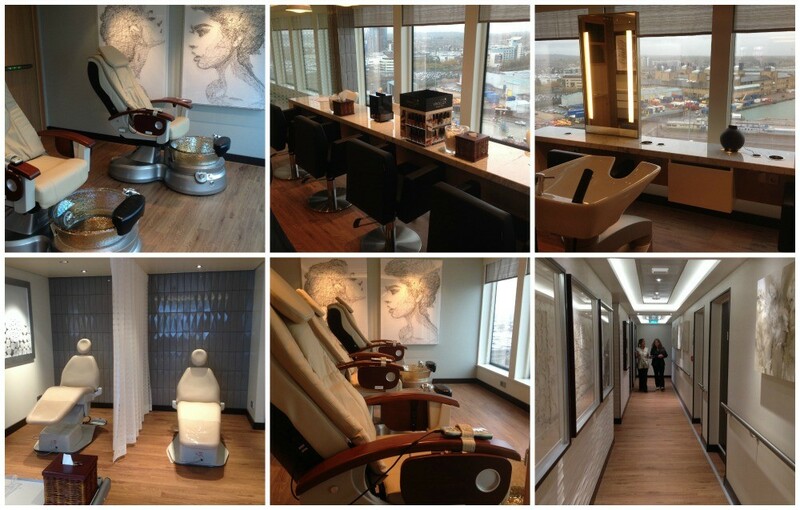 Also located here are the other rooms for massage hair and beauty treatments, each in a prime location and looking very spacious opposed to the above mentioned places. A hair cut for my wife was $69.62 inc 18% service charge and apparently they have been very busy. 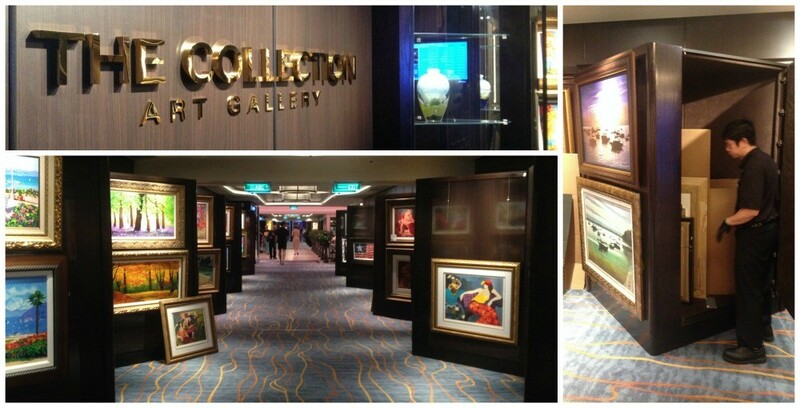 The art gallery is situated along the main walkway ‘Ocean Parade 678’ on deck 6 a high traffic area yet is not in the way. The auction takes place most days in the Headliners bar which is opposite Le Bistro. The artwork was like on many other ships very similar and run by Park West art. 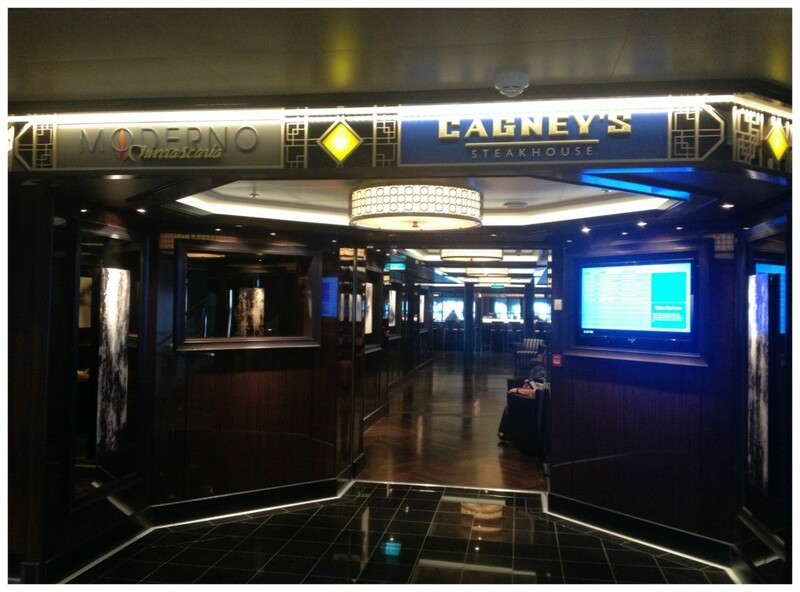 The shops are located on deck 7 below the casino and occupy both sides of the ship. The basic ship logo stuff can be had as well as the usual watches, jewelery and other items. Even a Lacoste shop is here not that I saw anyone in there, go figure. 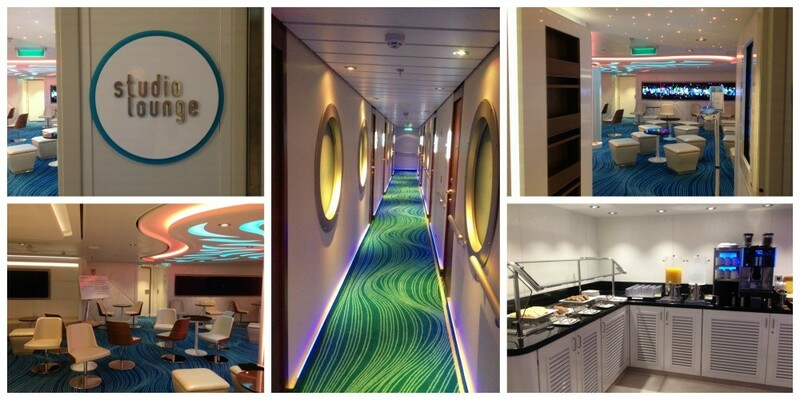 Is also here and maybe the best change in modern cruising as well. The photos are no longer taking up walls and walls of space but now in colour coded folders, but that’s where the change ends, the folders are full of all the printed out images using a lot of wasted print and paper. They do have the entire album of your images online as well for you to view. So my question is why print them all out? The prices are as per usual very expensive. The Norwegian Escape website advertises that it has 12 pools and hot tubs, well… The one main pool is small for a ship this size and with the seven hot tubs that are for everyone to use I can only imagine that it will be very busy. The three sunny days we had the tubs were full and the pool area very busy, the actual pool not too full. The Haven has its own pool and 3 hot tubs. The most noticeable thing to me was the amount of sun loungers on the decks, talk about crammed in like sardines and this was not a full ship, they even had piles of sun chairs stacked up waiting, I’m not sure where they will be able to go. 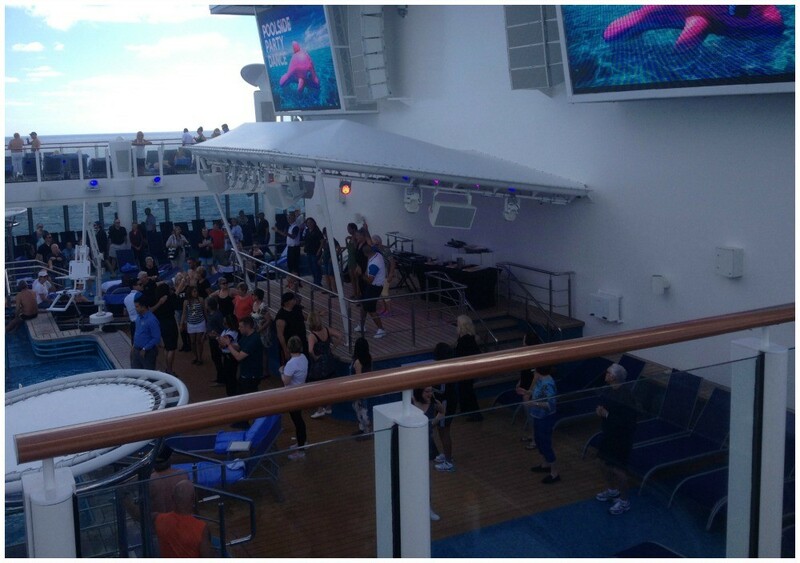 Overall I found the sun decks very busy and too cramped, even though these decks are on a few levels 16 thru 20 the walking area around the outer deck was very tight and to make it harder to get around there are glass partitions in various places. Most ships have a lot of activities on the open decks and I expect the Escape to be no different. This main pool area is very small to host much, but with the Spice H2O at the rear on deck 17 it might work. Plenty of smoking area up by the waves bar this time starboard side. On deck 19 you can go to the very front and sun bath, this is where you can find a couple of hot tubs along the side here. The opposite side is the Vibe Beach Club which you need to access from the port side or you will miss it. There is a good-sized kids aqua park with water splashing everywhere think ‘wild wadi’ etc, above here are the water slides and these looked like fun. The twin racer was out of action for our cruise not sure why but they required people from the German fitting company to fix them. At the Aqua park on the Escape is where you’ll find the second pool sandwiched between the kiddies aqua play area full with water jets, tipping bucket, tunnels etc and the end of the aqua racer, again it’s not a big pool and somewhat overshadowed by the huge gantry for the aqua rides. There is also a lawn bowls green under the ropes course area and the walking track is here. How many laps do you do? To do a five mile walk you need to walk around the circuit 40 times, talk about getting dizzy. 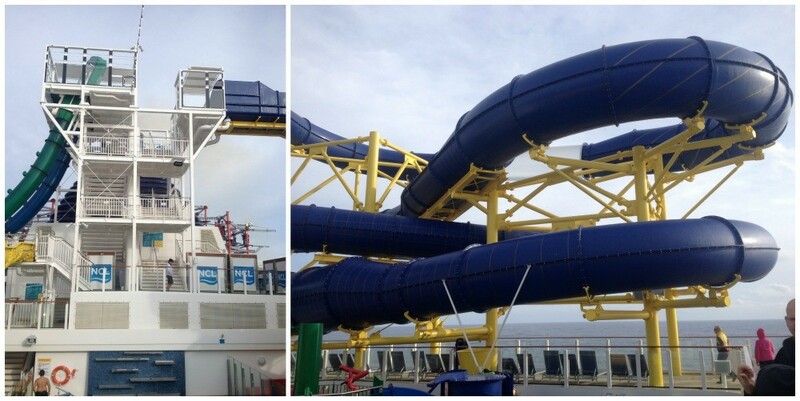 This is the biggest ropes course at sea and covers three levels with over 2,300 ft of heart pounding challenges with the highlight being the ‘Plank’ one on each side of the ship and protrude over the sides of the ship at a mere 172 feet above the sea below, believe me it’s not for those scared of heights. The course can be done at your own pace or should I say be dictated by the amount of people on the course and how fast or slow they all move around. Tip here... go when the weather is maybe not the very best and it will be a little quieter. No cameras or smartphones allowed up there either unless strapped on like a go-pro. This is at the rear of the ship on deck 17. It is an adults only area with two hot tubs, the Spice H2O bar, a huge screen lots of sun loungers and the Grotto. Even in the poor weather conditions some passengers enjoyed it here, well at least I assume so. On the last three days once the sun was out, it was a lot busier but I never saw anyone in the grotto cooling off so I can’t really report if this is a hit or not, to me it has the feel of a gimmick and it would be to have a pool here. Passengers have the choice of debarkation times and you collect your colour tags that reflect your debarkation time and place the bags out for collection by 11pm. 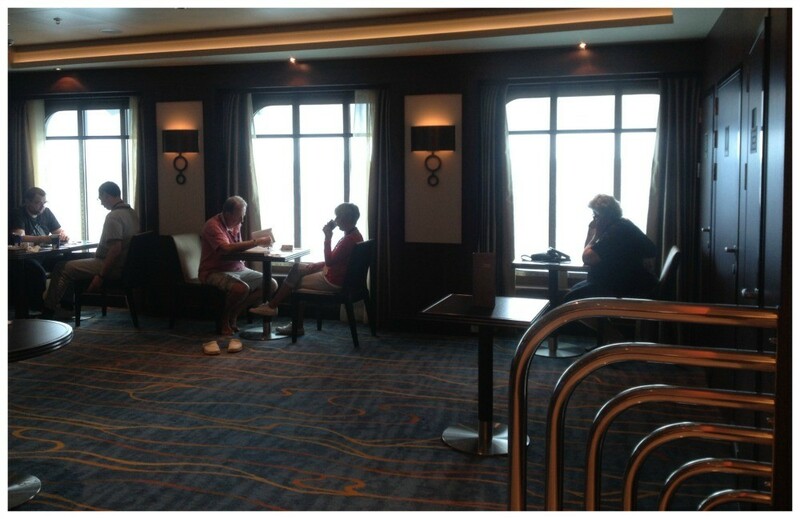 Breakfast in the buffet for the last time then after a look around the Haven area we vacated our cabin by the 9am requirement and waited on deck 8 in the Cagney’s bar area. Many passengers packed the waiting areas that were listed as places to wait. The debarkation was slow due to congestion in the immigration area. We chose to walk off with all our luggage and at around 9.30 when they allowed the next colour tags to debark and joined the cue to exit the ship. Getting off the ship was the easy part, the long wait was not so much fun. Once we were off the ship and in the terminal we had to wait 30 minutes until they had cleared the group in front before being allowed to enter further towards customs where the line up for customs were still huge. Before you could join the respective lines those who had to collect luggage needed to go to another room to pick them up, lucky for us we just joined the back of the line. Forty five minutes later we finally made it to the custom window for fingerprints, photos etc before being allowed to pass. The cruise director Julie was good, never too much speaking over the public address system and also not loving the sound of her own voice. 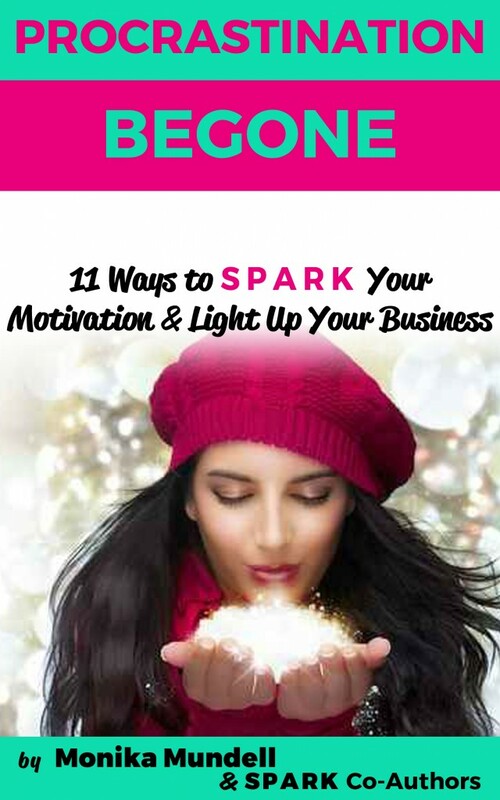 She was nearly always present when some activity or event was happening and if …. wasn’t there then her deputy … was. The P.A system was not over used, but when it was it needed to be a bit louder. Trying to understand exactly what was being said was difficult over the top of passenger voices in public areas. 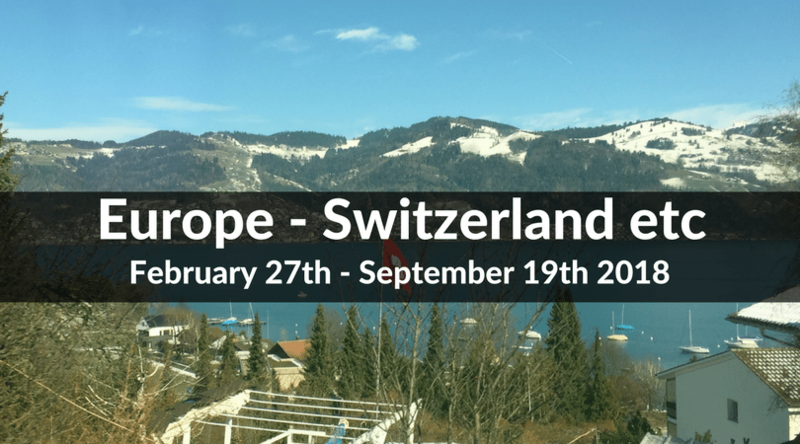 It was a mixed bunch of passengers with lots from the UK and the USA which makes sense plus there were group tours from Switzerland, Germany, Scandinavia etc. A few Australians but not many. Not to many families with kids which I can understand on a transatlantic cruise without any ports of call. The majority were of a middle age with not that many really old folks on board, there was a rather large amount of wheelchair passengers and also plenty with walking aids. Access for wheelchairs was well catered for from what I could make out. The majority of staff were more than helpful and always had a smile. Many from the South America. This was quite good with certain officers (Hotel officers) available every day at times noted in the Freestyle daily. As for seeing officers walking around the ship, this was a little quiet. The Captains photo opportunity was a mere 15 minutes! So that completes the review of the Norwegian Escape cruise ship and all its public venues on our 10 night transatlantic cruise in October 2015. As you can see we did not do or experience everything onboard. The Escape and what she offered on this voyage was very good. Being brand new was special and sure enough it will take a few cruises to get everything running smoothly for the crew and passengers. If you’d like to see more detailed posts about the restaurants and other parts of the ship then please visit various page links from our 10 night cruise. Our next cruise is going to be in Caribbean once again around mid February 2016. More on that later. Happy cruising people and don’t forget… Don’t dream your life – Live your dream. Hi Sarah, thanks for your kind words. I’m glad you found the review helpful. Are you looking at cruising on the Escape?